In a bowl, place 3c whole wheat flour. Add ½ t salt. Mix. yeast dissolves. Let mixture sit for 5 minutes for bubbles to form, indicating yeast is good. Add yeast mixture to flour, mix well. Add another ½ c warm water, and mix with hands to form a stiff dough ball. Place a tablespoon of flour on bread board (or work directly on a granite counter, as it keeps the dough from sticking). Knead 9 - 10 minutes. Place dough back into bowl and cover with a plate, foil, or plastic wrap. Place bowl inside unheated oven and let rise for 1 ½ hours. When ready, take bowl out of oven, place on counter, and punch dough ball flat. 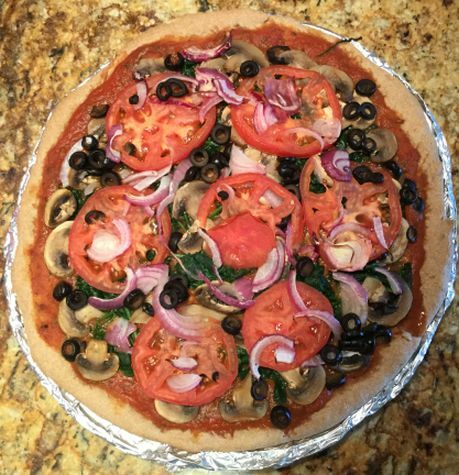 Place toppings on in the following order: marinara sauce, spinach, uncooked red onion, mushrooms, tomato slices, and olives, if using.